Nor-Amberd Multidirectional Muon Monitor (NAMMM) (Dorman 1975; Beglaryan, et al., 1989) located on the slope of the mountain Aragats (Armenia), at 2000m above sea level. Geographical coordinates is 40o22'N, 44o15'E. 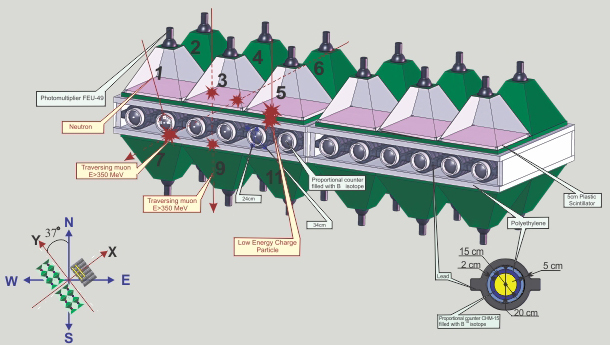 The NAMMM, shown in consists of two layers of plastic scintillators above and below two of the three sections of the Nor Amberd Neutron Monitor (NM). The lead (Pb) filter of the NM absorbs electrons and low energy muons. The threshold energy of the detected muons is estimated to be ~250 MeV. The NAMMM consists of 6 up and 6 down scintillators, each having the area of 0.81 m2. The distance between layers is ~ 1 m., and the interval of zenith angles determined by the paired coincidences of upper and lower scintillators is not greater than 25º. The data acquisition system of the NAMMM, the same as ASNT, can register all coincidences of detector signals from the upper and lower layers, thus, enabling measurements of the arrival of the muons from different directions. The raw data of the two sections of NAMMMs in the XML and csv formats available from CRD ADAS File server. columns 13-48 – the count rates corresponding to the 36 coincidences in upper and lower NAMMM layers, i.e. – corresponding to the traversal of the single charged particle (mostly muons with energy > 250 MeV). The order of the different directions in the file is following: [1-7] [1-8] [1-9] [1-10] [1-11] [1-12] [2-7] [2-8] [2-9] [2-10] [2-11] [2-12] [3-7] [3-8] [3-9] [3-10] [3-11] [3-12] [4-7] [4-8] [4-9] [4-10] [4-11] [4-12] [5-7] [5-8] [5-9] [5-10] [5-11] [5-12] [6-7] [6-8] [6-9] [6-10] [6-11] [6-12], where the first number corresponds to the upper layer and the second – to the lower. Also on the same Figure you can see the orientation of NAMMM axes according to direction to the North Pole, thus we can calculate the interval of the horizontal angles of incidence related to each coincidence. columns 49-55 – the count rates of the “special” coincidences different from listed above and forming the “full system” of possible configurations of the channel operation. Conditioned on the existing as minimum 1 signal in 12 NAMMM channels there could be the following possibilities of number of counts in top and bottom layers (the first sign in the pair is corresponding to the upper scintillator): many-many (more than one count in 4 top and 4 bottom layers), many-zero (more than 1 in top and nothing in 4 bottom), zero-many, zero-one, one-zero, many-one, one-many. The fraction of the “special” coincidences relative to the “main” trigger is posted in the Table 11.
columns 56 - the number of the “main” triggers – at least one signal in 12 channels in preselected time span (1 minute). If we consider all logical configurations of NAMM operation outcomes, this number will be equal to sum of the columns 13-55.
spectrum1 - spectrum6, the histograms of the energy releases in the upper scintillators are stored. spectrum13 - spectrum18, histograms of energy releases, in upper detectors are stored with condition that in lower detectors there was now signal, i.e., the energy releases of electrons and low energy muons filtered in the lead absorber. The information on the spectra of energy releases is essential for the continuous calibration of the all measuring channels. As one can see in the maximum of smoothed histograms are in the region 10-11 MeV, and this value should be monitored and kept constant during multiyear detector operation. In Figure 8 are presented 1-minute spectra summed over all four detectors and averaged over several hours. The blue curve is energy releases of the low energy muons and electrons (spectrum13-18) and the red curve is corresponding to high energy muons (subtracting from spectrum 1-6, spectrums 13-18). We can see than high energy muons in average can give much higher energy releases comparing with low energy muons and electrons. This additional information can be useful if Ground Level Enhancements (GLE) was originated by the primary particles having higher energy comparing with the GCR flux. Additionally to enhancement of the count rate we may notice some unusual features in the histograms of energy releases.